Small Green Shoots is a Kings Cross based charity working with NEETS (Not in Education Employment or Training) and with an ambition to introduce them to music concerts. Scoreys was part of UNTOLD, a week of story-telling events they ran under the National Storytelling Week banner. Scoreys featured two short stories by Edward P Jones, a Pulitzer Prize winning American writer. The stories – The First Day and An Orange Line Train to Ballston – are both about growing up as part of a black family in Washington DC and taken from Jones’s collection Lost in the City. 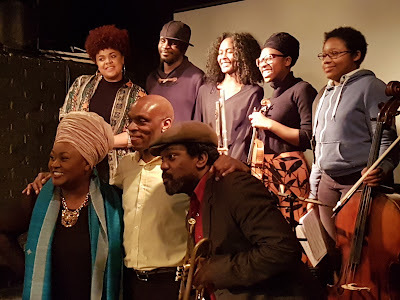 The stories were read (rather than sung) by jazz singer and broadcaster Jumoke Fashola, with the narrative in an English accent but the dialogue bought to life by a lively American interpretation. In modern Western culture we have lost the idea of story-telling as an art in its own right but this evening went a long way to restating its importance – which of course is the idea of National Story Telling Week. It was also a celebration of black cultural identity. The two stories were accompanied by music composed for the occasion by Byron Wallen (The First Day) and Trevor Watkis (An Orange Train to Ballston) although both were so involved in the music-making that the two pieces shared a common feel. The music consisted of themes, based around the key points in the stories but reflecting an overall mood rather than trying to punctuate events as a film score would. The words and music moved around each other, sometimes overlapping, sometimes separate, in a way that felt relaxed and organic although in fact it was structured. The instrumentation was unusual. 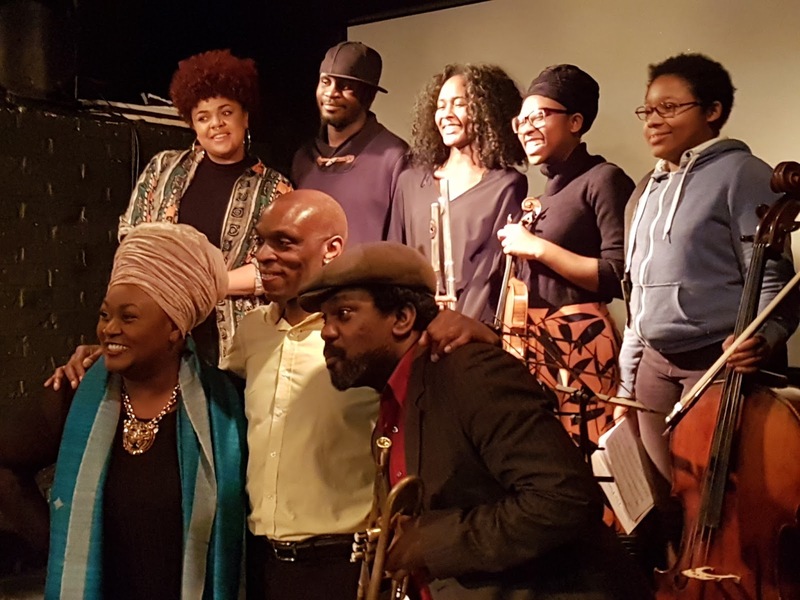 With Watkis (piano) and Wallen (trumpet) was a band of Trinity Laban students past and present, some classically-trained, some jazz musicians: Aanu Sodipe – violin; Eliane Soedirman – cello; Chelsea Carmichael – bass clarinet; Davinya Cooper – flutes; Daniel Casimir – bass. The tempo was slow or medium; the playing was more smooth than staccato and the themes were relatively unconvoluted (by jazz standards). This enabled the composers to experiment with colours and textures and to change the chords and harmonies almost like a choral piece or as if the band was a chorus for the main narrator. Only for a short period at the end of the first piece did Watkis and Wallen form a breakaway trio with the bass and play something more conventional. So, mainly scored pieces; strings and woodwind, no percussion; some classical players; no frenetic tempo; no hard-blowing solos but still definitely jazz, not least because the double bass did the job of driving the rhythm forward. This kind of music also draws on a deep history of jazz composition and the reason we don’t hear more of it is primarily economic rather than musical; it costs money to rehearse a band like this. I loved hearing the stories with accompaniment although it inevitably meant that the music did not have your undivided attention. I’d like to hear these pieces again and I think they deserve to be heard and even expanded into a suite. What I also got from this gig was a sense of hope and optimism about the future of jazz in Britain. Both the band and the (warmly appreciative) audience were at least half young, black and female. It made me feel rather old – but very cheerful.